Red Dream Studios recently completed one of its nicest site deployments to date (or at least we think so) for Appartement Place Versailles, a large apartment complex in the heart of Montreal, right next to the best shopping center in all of Quebec (Place Versailles). 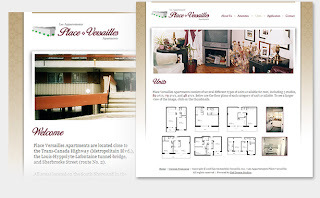 For this website, we used an executive approach for the design to accentuate the prestige of the building and the units available for rent inside, with a burgandy red, beigy gold, and light gray colour palette. To give the website an unfettered look, the content is relatively sparse, to the point, and clean overall - after all, the main point is to showcase the photos of the building and to drive visitors to apply for a lease online. The site features bright photos and enlargeable floor plans of all the unit types available for rent. Having had ownership of the building for over 30 years, we convinced the proprietor that it was certainly about time to showcase the property online in order to start branding it as a successful business. Posted by Unknown at 10:40 a.m.